Nigeria High Commission to Ghana, Ambassador Femi Michael Abikoye has paid a working visit to the Eastern Region. As part of his visit, he paid a courtesy call on the Eastern Regional Minister, Hon. Eric Kwakye Darfour to discuss matters that are purposed to strengthening the relations between Nigerians living in the Eastern Region and the Regional Coordinating Council and also offer him the opportunity to interact with the Nigerians living in the region. In his opening statement, Amb. 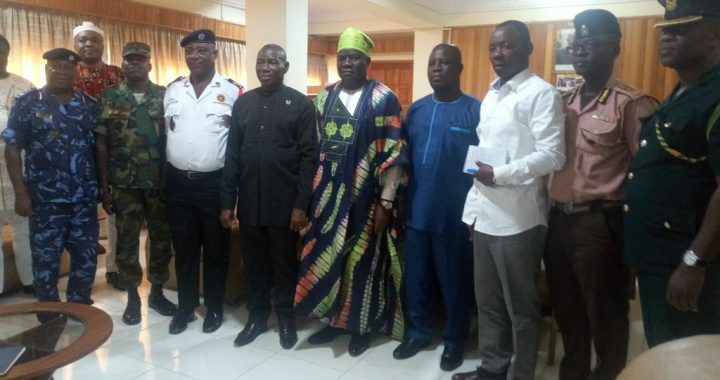 Femi Abikoye said, the relationship between Ghana and Nigeria is already strong therefore his visit to the Eastern Region which is the ninth region that he has toured out of the ten regions in the country is only to make the relationship between the two countries Stronger. “There is already Cooperation between us but we need to cooperate more, there is already collaboration between us but we need to collaborate more, we have strong bilateral trade but there is always room for improvement”, he added. The Honorable Eastern Regional Minister, in his welcome address, expressed his happiness about the visit. He said, the Eastern region has a sizeable number of Nigerian citizens, some students, traders doing buying and selling and others have also find themselves in the cooperate businesses, adding that the Nigerians have integrated into the Ghana to the extend that it is even very difficult if not impossible to differentiate between Ghanaian and Nigerian. Both countries are Anglophone countries, thus we were once upon in time colonised by the British hence we need to collaborate more because we have a common history and a common language ( English) which is positive for doing business. Touching the challenges, the ambassador said, he has received complaints about immigration fees and renewal of documents but was quick to state that the matter is being discuss at national level. He thanked the security services of the country for their professionalism. The Ambassador and his team later on visited the Municipal Chief Executive for New Juabeng Municipal Assembly, Hon. Comfort Asante who after some interaction led the team to visit the Palace of New Juabeng Traditional Council. Accompanied the ambassador were,Mr. Richard Ikeyi, the Minister in charge of Education, Mrs. Oyenike Dolapo,the 2nd Secretary, Mrs. Omobola Babafon, the President and Executives of Association of Nigerians in Eastern Region and some staff at the High Commission.